Our rose water is 100% pure and natural product. It is obtained by steam distillation of fresh rose blossoms, hand picked from our rose fields during the annual rose harvest in the world-famous Bulgarian Rose Valley. Our Bulgarian Rose Water is pure, undiluted, food-grade product. It does not contain any preservatives, additives, or synthetic ingredients. It is very important to be sure that the rose water is 100% natural product. Many manufacturers label their products containing rose water or essence but it could be synthetic. Synthetic rose ingredients have no therapeutic value at all and are full of chemicals and preservatives. Therefore, it is important to look for rose water that is fresh steam-distilled and with no additives. In 2007 we finished the certification process with Ceres GmbH and we are glad to offer USDA N.O.P. 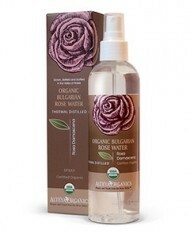 Certified Organic Bulgarian Rose Water. The roses used for making this product have been organically grown, distilled and bottled under the strict control by Ceres according to USDA National Organic Program standards. 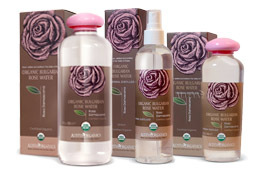 Our rose water is a 100% pure and natural steam-distilled product. The rose water is certified by the Bulgarian Government-appointed laboratory at the Research Institute for Roses, Aromatic, and Medicinal Plants – the ultimate rose otto authority in the world. Our Rose water is one of the all-time best and most traditional facial cleansers and has multiple skin-care uses. The natural rose water has great nourishing, calming and balancing properties and is used to treat acne, dull, lifeless, irritated skin and sun burn. Bulgarian Rose Water is applied to help nourish and hydrate both skin and hair. Rose water is also added to bathing water and is used for moisturizing the body after bath. It helps balance skin pH level; rose water has anti-aging and rejuvenating effects on body and mind. The rejuvenating fragrance of rose water uplifts the spirits and harmonizes the mind. Rose water stimulates our sensations, enhances romance and improves ability to love. The beautiful fragrance, therapeutic effect and multiple uses makes Rose Water a must for every household. By using a unique distillation technique, which embodies century-old traditions and modern technology, we distill a special grade rose water that completely preserves the biodynamic energy of the rose plant. Please contact us for lowest bulk prices of rose water. Fine mist for your every day routine. Spray directly onto skin and hair. After cleansing and after shower. Food and beverage flavor enhancer. Apply gently with a cotton ball onto face and neck morning and evening after cleansing to tone and refresh skin. Mist Rose Water over your entire body after shower or to freshen up any time for a splash of gentle aroma. Use daily as a natural aftershave lotion. Spray your face, body or your room with Rose Water. Breathe deeply to revitalize and rejuvenate your body and mind. Use in numerous beauty-home-made formulations. Use in many exotic culinary creations. Rose Water has been used in skincare for many centuries. This gentle natural ingredient has excellent skin enhancing benefits. It is very gentle and suitable for all skin types, even the most sensitive. As one of gentlest astringents, it is often used as facial toner. It calms irritated and inflamed skin, and also helps clean and detoxify pores. Alteya’s Rose Water has excellent nourishing, toning and hydrating properties. Many use pure rose water to clear blemishes and imperfections, and promote even skin tone. Also, it is said that the essential oils in rose water balance skin’s ph levels and rejuvenate tired, dull, mature skin. Some experts believe that rose water can be very helpful against sun damage and skin aging. A lot of research has been done on how rose oil and rose water might lessen the appearance of broken superficial capillaries and even skin tone and texture. Also, the natural moisturizing and stimulating properties of Rose Water makes it a great addition to your hair care regime. It is suitable for healing minor scalp irritations and might help with dandruff. It is known to improve healthy hair growth and shine. This gentle form of aromatherapy is suitable for sensitive people, pregnant women and kids. It contains all the plant essence components as essential oil and all beneficial qualities but it is gentler and does not have to be diluted. The rejuvenating fragrance of fresh roses uplifts the spirits and harmonizes the mind. It has toning and restoring effect and is known to help emotional strength. The gentle rose fragrance stimulates our sensations, enhances romance and improves ability to love. Rose Water benefits emotional processing, empowers the mind and assist in decision-making and completion of projects. It is regarded as a mild sedative and anti-depressant. The Rose Water is increasingly used in treatments for conditions of stress, nervous tension and anxiety. Spray your face, hair and body and breathe deep for one minute to clarify and soothe your mind. Use as a bathtub supplement for stress relief or spray your room, bed sheets, and clothing. Rose Water provides a wonderful scent around the house by spraying rooms, wardrobes and draws. It clears stagnant, negative energy and brings freshness and serenity. The pure flower water works wonderfully as a linen and pillow spray and for scenting ironed clothes. The beautiful fragrance and multiple benefits of Rose Water have made it a valuable ingredient in various cuisines throughout the world. The aromatic Rose Water is used to flavor Baklava, ice cream, scones, and cakes, rice dishes and fruit salads. Another benefit of pure Rose Water is that it can be used in many nutritious beverages. It is used as an addition to morning juice, tea, milk or plain glass of water. Just mix a teaspoon or two with your favorite drink and discover the full flavor of rose water. It is said that it aids digestion and enhances skin tone and complexion. Rose water, the heady distillation of rose petals and steam, is something of an acquired taste for Western palates. Its scent may hint of secret gardens and distant nations, or perhaps it’s the overwhelming fragrance of a department-store perfume counter that comes to mind. While never a fan of rose water’s taste, I admit to a fascination for a flavoring with such a rich history. The ancient Egyptians, Greeks and Romans extracted flavor from rose petals by steeping them in water or oil, and in the ninth century, Persia began the distillation of rose water. What drew me in to the wonders of rose water was a recent article in Gourmet magazine featuring a couple of Brits, Samuel and Samantha Clark, whose London restaurant, Moro, focuses on dishes from Morocco and Spain. The pairing sounded exotic and delicious, a concept worth exploring. I began experimenting with a few drops of the water in my own morning glass of orange juice. The flavor was an eye-opener. Fragrant and fresh with just a suggestion of rose, it transformed the simple glass of juice. Further investigation uncovered a global pantry of ideas. Rose water is used in a variety of Indian curries, Greek pastries and MiddleEast dishes, including the candy Turkish Delight and a baklava that mixes pistachios with a rosewater-honey syrup. Marzipan, the sweet paste of ground almonds and sugar, was originally flavored with rose water. The secret to using rose water as a flavoring is to add it in small amounts, then tasting and adjusting the flavor to taste. Pair it with spices such as cinnamon, nutmeg and cardamom, with citrus fruits, peaches, nuts and chocolate. Once opened, rose water should be stored in the refrigerator for freshness. Rose water can be found at specialty-food stores and well-stocked supermarkets with other flavorings and extracts. Combine water and sugar in a saucepan and heat over medium-low heat, stirring just until the sugar has dissolved. Remove from heat and cool. Stir in lemon juice and rose water to taste. Chill well before serving. 1. In a 3 ½-quart pan combine water, sugar, lemon juice, cinnamon and cardamom. Bring to a boil, stirring to dissolve sugar. Reduce heat and simmer gently 10 minutes. Stir in dried rose buds and rose water. Simmer 5 minutes. Remove from heat and cool 5 minutes. 2. Meanwhile, bring a pot of water to the boil. Remove from heat and add peaches. Time about 30 seconds or just until skins begin to loosen. Remove peaches and rinse gently with cool water. When cool enough to handle, slip off the skins. Cut peaches into quarters, discarding the pits, and put into a bowl. 4. Remove rose buds, cinnamon sticks and cardamom pods from syrup. Spoon peaches with some of the syrup in glass bowls and serve with cookies. 1. Preheat oven to 350 degrees. Lightly spray a 9-inch tube pan with cooking spray and set aside. 2. Put the pieces of butter into the large bowl of an electric mixer and set aside about 15 minutes to soften. Grind almonds finely in a food processor or blender and set aside. 3. When butter has softened, cream with sugar on medium speed until fluffy, about 5 minutes. Add eggs, one at a time, beating well after each addition. Stir together flour and salt. Slowly add to the creamed mixture, beating until batter is smooth. 4. Remove about a third of the batter and add rose water and jam, stirring until smooth. Stir the ground almonds and almond extract into the remaining batter. Spoon half of the almond batter into the prepared pan, spreading evenly. Spoon all of rose batter into the pan, spreading evenly. Then top with remaining almond batter and spread until smooth. 5. Bake cake on center oven rack 50 to 60 minutes or until it tests done. Cool cake in pan 15 minutes, then run a knife around the outside edge and also around the center tube. Invert onto a cooling rack and cool completely. Dust with powdered sugar before serving.